KARACHI: Senior Superintendent of Police (SSP) Malir Rao Anwar on Thursday dropped a bombshell, saying that Muthidda Qaumi Movement has links with Indian intelligence agency RAW for carrying out terrorism in Karachi to destabilize the country, ARY News reported. In a press conference here, he said police will nominate MQM chief Altaf Hussain and their two London-based leaders Nadeem Nusrat and Muhammad Anwar in the First Information Report. "The MQM is even worst than the Tehreek-e-Taliban." We request the government to impose immediate ban on the MQM as it is involved in anti-state activities, said Anwar. The SSP claimed that MQM’s Muhammad Anwar, Nadeem Nusrat and MQM chief Altaf Hussain are in contact with Indian intelligence agency Research Analysis Wing. In Karachi, Farooq Saleem and Hammad Siddiqui issue direction to activists for different criminal activities. The MQM workers get training in Indian city Dhodan. After training, MQM workers arrive in country through Lahore border. 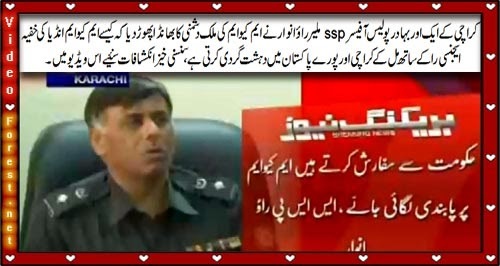 SSP Anwar said MQM workers go to Indian on directions of party chief Altaf Hussain.